Going out with a bang! Taylor Swift and her glamorous girlfriends including Gigi Hadid, Blake Lively, Cara Delevingne, Ruby Rose and Uzo Aduba dressed in patriotic flag outfits late on Monday, July 4, as they gathered outside the star&apos;s Rhode Island home for a firework display. 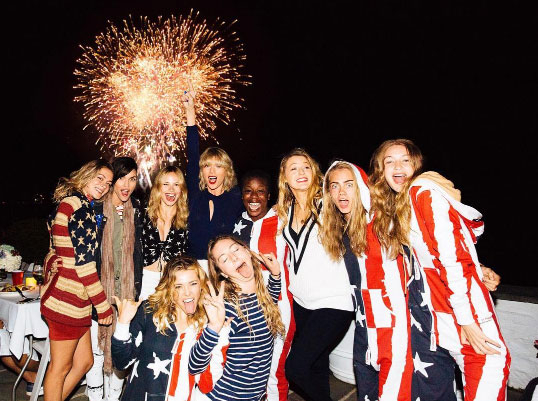 Posing for a hilarious photograph, Taylor and her squad were dressed in red, white and blue, smiling and pulling funny faces as they posed in front of a backdrop of fireworks. "Happy 4th from us" the 26-year-old singer captioned the snap, the only one she shared of the entire, star-studded weekend-long celebration. But as Us Weekly reported yesterday, the girl-gang posed for several other photographs during the Independence Day celebrations — including one in which they all wore swimwear, while frolicking in the ocean. And it wasn&apos;t just the girls who spent the weekend partying. Swift&apos;s new beau, Tom Hiddleston, was also invited to join the celebrations. The pair were photographed hugging and smooching as they played around in the water with Swift&apos;s new British hunk literally wearing his emotions on his sleeve (and his chest). While the 1989 hitmaker celebrated the 4th of July wearing a bright red bikini with the word "America" emblazoned across her chest, Hiddleston&apos;s attention was focused firmly on his new girlfriend. The 35-year-old Thor star wore an "I [heart] T. Swift" tank as he swam in the ocean, and also had a temporary heart tattoo with his beau&apos;s initials etched onto his bicep.